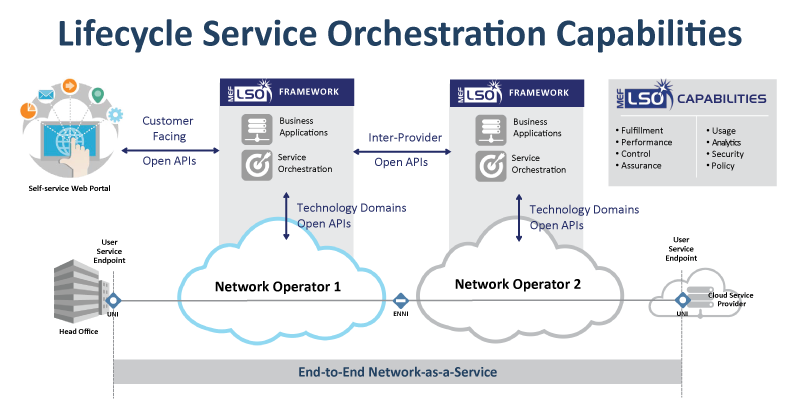 MEF is developing LSO (Lifecycle Services Orchestration) specifications with open APIs to automate the entire lifecycle for services orchestrated across multiple provider networks and multiple technology domains within a provider network. LSO enables service providers to transition from a silo-structured BSS/OSS approach towards flexible end-to-end orchestration that unleashes the value of SDN and NFV. Standardized LSO APIs are critical for enabling agile, assured, and orchestrated services over automated, virtualized, and interconnected networks worldwide. A growing number of service providers are offering or planning to offer Third Network services, and they want to make them widely available without being constrained by the limits of their own physical network footprint. But to expand service reach and deliver more dynamic services, they need a standards-based approach that facilitates interoperability with other providers and supports end-to-end service automation. Many providers also are looking for a standards-based approach to service management that allows them to overcome OSS/BSS hurdles that currently impede their ability to offer on-demand services over their own networks, effectively scale those services, and realize the full potential of SDN and NFV. LSO is particularly important for industry growth because it will enable the creation of a worldwide ecosystem of connected networks that support orchestrated connectivity and NFV-based services. These services have the potential to dramatically reshape the industry landscape and fuel a whole new wave of productivity-enhancing innovations. MEF's LSO Reference Architecture and Framework (MEF55, March 2016) is a key resource for learning about LSO, which aims to streamline and automate the service lifecycle for coordinated management and control across all network domains responsible for delivering an end-to-end orchestrated service. The LSO RA describes the management entities needed to support LSO and the Management Interface Reference Points between them. The Management Interface Reference Points are described such that they can be realized by Interface Profiles and further by open APIs, which can be used to automate and orchestrate services. LSO provides open and interoperable automation of management operations that include fulfillment, performance, control, assurance, usage, analytics, security, and policy capabilities. MEF currently is building upon the LSO Reference Architecture to advance work related to LSO interfaces, standardized open APIs, operational processes, and information models required for orchestrating services across multiple providers and multiple technology domains. In a groundbreaking development in late February 2017, MEF and TM Forum announced they are collaborating with major service providers in a transformational initiative to standardize LSO APIs for orchestrating connectivity services across multiple networks worldwide. Eight of the world's largest service providers are leading efforts within MEF to develop a complete suite of inter-provider LSO APIs that use the LSO Reference Architecture and the TM Forum Open API framework. This project revolves around the LSO Sonata Reference Point that deals with the management, operational, and business interactions between service providers. MEF and TM Forum members aim to accelerate inter-provider LSO API standardization by implementing a more agile development process and leveraging many of TM Forum’s 31 Open API specifications. Project participants are planning for a software development “sprint” at the end of which the first inter-carrier LSO APIs will be implemented in late 2017. Eight LSO Sonata API definitions are planned to be standardized. The first three of the following APIs are expected to be defined in the first round of the project – “LSO Sonata Release 1” – by the end of 2017: (1) address validation, (2) service availability, (3) ordering, (4) quoting, (5) billing, (6) assurance, (7) testing, and (8) change management. 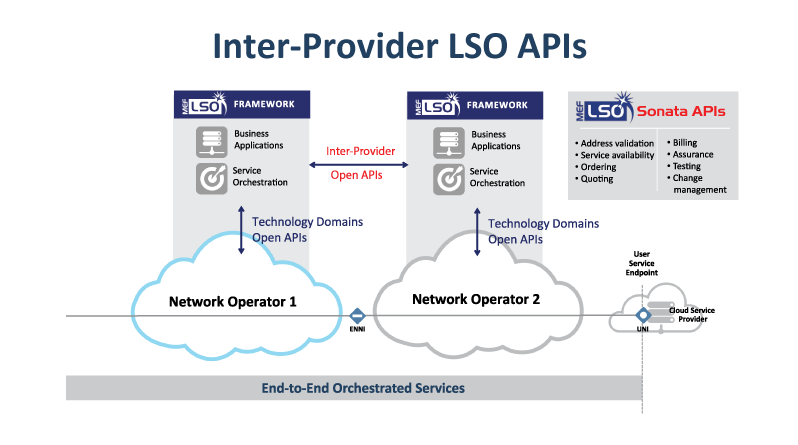 “MEF is delighted to host pioneering inter-provider LSO API standardization work that will help unleash the power of on-demand services orchestrated across a global ecosystem of connected networks. Our collaboration with TM Forum and major service providers is a key step toward automating the $50+ billion Carrier Ethernet services market with LSO and will be foundational for orchestrating IP and wavelength services across many provider networks as well. “Our research shows that the number one issue impeding the delivery of on-demand services is the need for a standardized approach to orchestrating services across multiple provider networks. This initiative led by industry leaders to collaboratively standardize on APIs for Ethernet services is an essential step toward tackling this challenge. “The more companies that are using a standard, the more powerful and beneficial it becomes for everybody. As momentum builds, more and more operators, vendors and other partners will find it advantageous to join in or they will be faced with the danger of falling behind their competitors.